Since 1968 when Fr. Dunstan Schmidlin started the Southwest Indian Foundation (SWIF), our mission has been to help the Native Americans in the Southwest not with mere handouts, but by restoring pride and independence. SWIF has always offered aid when true need was present, but has gone beyond that by recognizing the great human potential of each individual, and by helping each realize that potential themselves. In 1996 The City of Gallup asked SWIF if they would take over the Santa Fe Depot and to use it as a cultural center. While this may have seemed like a departure from SWIF's original mission, with great vision SWIF accepted the offer from the City and created the Gallup Cultural Center (GCC). 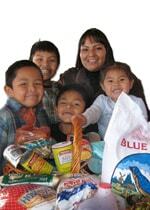 For decades SWIF carried out its mission by providing for the physical needs of the southwest Native Americans while helping individuals and families to support themselves. In 1996 SWIF got the opportunity to help in a new way: providing for the cultural and educational needs as well as the physical needs. The GCC acts as headquarters to the many educational and cultural programs sponsored by SWIF. The largest and longest running of these programs is the Annual Art Scholarship and School Awards Program. For the past 17 years the GCC has partnered with The Reunion of the Masters, a group of Native American artists from many indigenous peoples, and together we have accepted art submissions from students across the southwest for a chance to win scholarship money to be used towards their art and educational pursuits. To date, SWIF, through the GCC, has awarded over $400,000 in scholarships to young artist. Submissions are accepted from students, kindergarten to 12th grade, divided into 6 categories with 48 winners each year. Our Special Education category is comprised of special needs students from kindergarten to 12th grade. One of these students is Ezander Benallie. Ezander is autistic and mostly non-verbal. He responds with ether short answers or by repeating what is asked. However, once he steps into the art room the smiles come out. I got to see these smiles first hand when he came to the cultural center to see his own artwork on the wall with an Honorable Mention ribbon hanging on it. While Ezander may always find joy in painting no matter who sees it, for most students winning an award speaks volumes. It shows the kids that their art is not only for themselves but can be enjoyed by others that see it. Also, the award expresses to the students that their work is worth something and their efforts have real tangible value. Such a confidence booster can encourage a student to continue pursuing art. Submissions are due in the middle of November which gives us enough time to organize and hang all of the artwork in preparation for art week. During art week, the Masters come to the GCC to help judge the art and hold free art workshops for all students in the area. Built into the scholarship program is our matching award system. Each award, first through third, won by a student earns a matching award for that student's school. Throughout the year, scholarship winners contact the GCC to use their scholarship money for many different educational purposes. There is nothing more reassuring that we are fulfilling our mission than to hear that one of our winners is using their scholarship money to help attend one of the top art schools in the country. We look forward many more years of our Art Scholarship Program to help foster skill and interest in art that will help them throughout their life.